Subjective viewpoints can contain truth. Subjective viewpoints can contain falsehood. The truthmaker is external to the subject. I am fascinated by the idea of being wrong, especially given our culture’s current attitude toward it; Kathryn Schulz’s excellent TED talk is a fun but revealing treatment of one of the West’s foibles. The title of this post, “Si enim fallor, sum.“, is actually the earlier (and better) version of Descartes’ “Cogito, ergo sum.” Penned by Augustine, it means something like, “If truly I err, I am.” Lest the significance of this be lost, note that a computer cannot ‘know’ that it is wrong. It’s not even clear whether dogs can be truly sorry, or whether it is a conditioned response, kind of like p-zombies. (Admission: I have not extensively researched this.) What does it take in order to be able to know that you are wrong? The shorter paraphrase is, “Science advances one funeral at a time.” According to St. Augustine, you might say that the old opponents have stopped being ‘I’s, or more briefly, they’ve stopped being. The philosophical/religious term being is a notoriously difficult one, but I just want to pick out the idea of living consciousness. Furthermore, let’s be precise with ‘living’: there needs to be some semblance of growth, whether that be in the realm of substance or in the realm of thought. A rock is not living (unless it’s a Horta); it does not adapt to better ‘match’ reality over time. Instead, it merely erodes and fractures, to perhaps play a part in life sometime in the future. Now it’s time for the hard version: ‘the good’. In our age of moral relativism, you might say that there is no truthmaker for what constitutes ‘the good’ outside of each individual person. That is, there is no ‘common good’; there is only your ‘private good’, and mine. They might conflict, so we both sign a social contract which keeps us from bumping into each other too much. 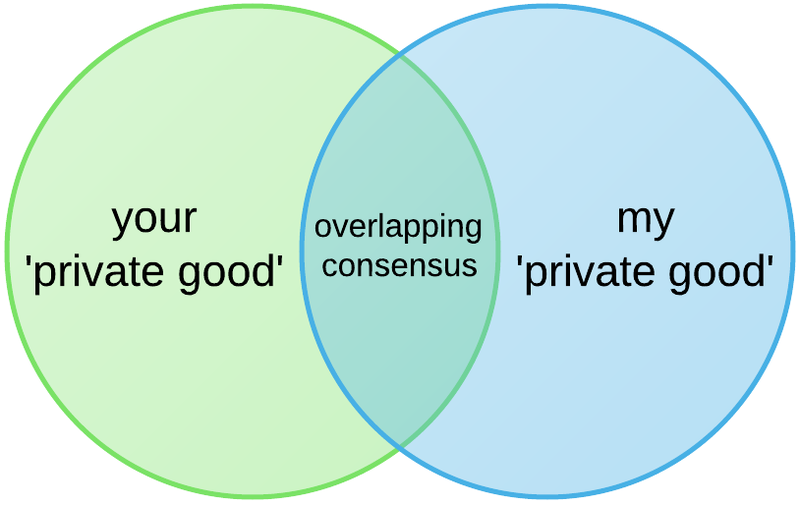 After all, we have some sort of overlapping consensus; the Venn diagram of our conceptions of ‘the good’ has a non-empty intersection. But maybe the overlapping section is 100% different for any given culture? C.S. Lewis, in The Abolition of Man, says no: the Tao is just another part of reality and one actually does find a lot of consensus among cultures on the basics, which in the appendix Lewis calls “general beneficence”, “the law of justice”, “the law of mercy”, “magnanimity”, etc. The Tao really doest exist outside of ourselves and is not merely defined by us, any more than a rainbow is defined by our perception of it. Can I be wrong when it comes to my conception of ‘the good’? Can I know that I am truly wrong? Do I have being in the moral domain? Wikipedia’s list of cognitive biases is a favorite of some on the internet, but do any of them have to do with ‘the good’? Let’s return to the issue of life. Life begets life after its own kind, while rocks just are (until they aren’t). I think it’s fair to say that scientific knowledge is alive. Newton’s three laws weren’t the be-all and end-all; we found ways that nature found to prove Newton wrong and we can do it, too. Thus we need better and better laws. The new is like the old; indeed, general relativity reduces to F = ma in low-mass, non-relativistic-speed scenarios. It’s like Newton’s creation had a kid and got out-performed. Good fathers are proud when their kids outdo them. So, I could ask whether a conception of ‘the good’, whether the Tao, can be alive. In other words: a practice produces real output that gives humans increased ability to pursue excellence, and can itself grow, so that future output continues to be better than past output. This concept of life is very present in science: if you want to see whether a given paper is likely to have a bead on the truth, see who cited it; see what ideas it begot. But perhaps some practices can cause one to start deviating from reality? This most definitely happens, but my suspicion is that investigation of such practices is that they start to die. It is as if detaching from reality detaches one from the source of life. believing that things truly are as they think they are. Some of you may see the allusion to Gödel’s second incompleteness theorem; I will talk about that at a later time, or in the comments if someone asks. The type-I error is easy to understand, but the type-II error could some some explication. Time for a history lesson! Due to the ancient Greeks’ love of spheres, they thought that all planetary motions must be circular. When the ancients carefully watched the sky, they realized that they weren’t always observing circular motion. To ‘fix’ this, Ptolemy formalized the epicycle (Apollonius of Perga discovered them). Look at the diagram at the right: it’s made entirely of circles! Ptolemy found out that if you have planets moving in circles, within circles, you can better approximate their observed motion. And so the ancients had their cake and ate it too: the planets only ever moved in circles, their observations matched theory, and no barbarian impurity was permitted. You might think that it took until Johannes Kepler to figure out that planets actually move in ellipses. This isn’t quite right; as is often the case, the Muslims had figured it out first. Ibn Bajjah discovered a model of planetary motion which did not require epicycles in Spain during the twelfth century. Too bad we didn’t pay attention to him, or we might know more, today. It turns out that epicycles are actually the first step in a fully valid mathematical approximation of ellipses, or actually any other step. Nevertheless, they had a weakness: it was hard to do math with them. The circular mathematical world was too small: a type-II error had been committed. The circular mathematical world may not have been incomplete theoretically, but it prevented minds from making progress. How do I know if I have made a type-II error? Occasionally, I might be able to introspect and see that I have. That being said, I believe it is far better to try to convince other people to see things my way. Suppose my idea is not subject to a type-I error. The more people to whom I successfully describe my idea, the more likely they will either i) verify that my way is the most economical [known] way; or ii) show me a better way. Now, other people can equally well show me that I have made type-I errors in my thinking. But this is well-known and kind of boring. Type-II errors seem to be less-well understood, and yet extraordinarily important! Any given [human] mind is only able to hold so many symbols in memory at once: if the number of symbols required to represent an idea can be reduced somehow, it is almost always a win. Furthermore, Gödel hinted that there will always be truths which cannot be proven with our current beliefs; if this is true, we must always be willing to admit that our world needs enlarging. Ok, let’s suppose I have decided against insanity, by ensuring I can get other people to see things my way (with them hopefully making me see things differently at times!). Call this ‘intersubjectivity’. Am I all set? Is there nothing better? No. The next step is to expose your thinking to people vastly different than you. This is a really hard task. Groupthink is easy. Groupthink lets you avoid asking certain questions—whether they are uncomfortable, obnoxious, or otherwise. There are even psychological reasons to delay questioning certain assumptions: we cannot question everything at once, and if we do too much criticism before we’ve built ideas up enough, they may come crashing down even though something valid was being constructed. More on that in another post. Any scientist will verify that we only “see through a glass dimly”. In other words, we are prone to drawing invalid conclusions from the observations we make. But scientists have discovered that when enough people are able to see the same thing through the glass, things are less dim. This is called intersubjective agreement (WP). The more different people I can get to agree with me on how I see things, the more confident I am that I have a pretty good idea about things. There is no guarantee that it is the best way, but it is a guarantee that if someone knows a better way, he/she isn’t part of the group, or he/she is staying silent. What it means to think clearly is arguably a relative term: if I am the clearest thinking caveman in a group of cavemen, I may still have an awful lot of wrong ideas. But that’s ok, because it just seems to be a property of ‘mind’ that when they congregate, they can help each other think more clearly. Then again, they can choose the less energy-intensive echo chamber option. I vote for expending more energy so we can go more interesting places.